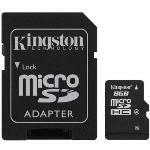 Kingston MicroSDHC Class 4 8GB Expert Reviews - Read Reviews and Buy Smarter Online. Cons: Very expensive, Tall heatsinks may cause compatibility issues, High frequency doesn't scale in many real world applications (at least not yet…. Verdict: Kingston's HyperX Predator 3000MHz 16GB kit costs ￡349.99 at Overclockers in the UK on pre-order. We haven't been able to find it listed anywhere else but we can infer U.S pricing of around $450-500. Kingston supply a lifetime warranty with this product. Verdict: We look at the latest memory card from Kingston, the UHS I Class 3 SDA3 SD card. Is this new SDXC product for for you and your recording? Read on. Verdict: Last month Kingston Technology announced HyperX Beast, which was is a series of memory kits that have been designed for those wanting the largest DRAM capacities possible at performance memory speeds. Verdict: There's two things you can never get enough of with digital cameras: battery life, and storage. For the last couple of months I've been using Kingston's 8GB SDHC Memory Card [ Low Price Search ] in my digital cameras. Verdict: Have older Nikon Coolpix camera, which makes it difficult to find suitable memory cards. Easy to replace & good value of product. Verdict: Excellent customer service and the card works well. Was also mailed an SD to USB adapter free, which was a huge bonus because I was concerned about how I was going to do file transfers. Verdict: I purchased this for an Acer Iconia Tablet that can have its storage extended by 32 GB. This product fit the bill perfectly. I would always recommend Kingston products. Verdict: Very good service. Product was delivered quickly and in good working order. Verdict: I have about 2 dozen of these and keep all my videos on the to watch on my 8 gig tablet. They all work great and have never failed me, though the lock on one of my adapters broke, that was not a problem as I have so many,. Verdict: Ok the sd card was very nice , but first I could not able to use in Samsung j7. Then I get idea to format the card and use then it's shows sd card is available. Then I says to god thanks because I bought for my aunty, she is going to abroad tomorrow. Verdict: I bought this hoping that it would transfer data to and from my computer faster than its built-in card reader. It is faster but doesn't keep up with fast SD cards. Verdict: I brought this card for my Fiio X3II music player to do firmware updates. I have not noticed any problems with the card either in the player on on my Linux computer. Verdict: Purchased for use in trail cameras. No problems so far, even in cold weather. Verdict: It is a very good item. I use one on my cell phone, also another one on my camera with the adapter. It is a good price and worthy. The speed is fast and very easy to take. There are enough space to keep all the pictures in my camera. I have to say I love it! Verdict: Arrived in good order. Thank ypu. Verdict: Excellent Storage Device Pros:- The externals of this fancy pen drive have been made with a good quality rubber and hence the chances of any kind of physical damage to the pen drive in case of falling or slipping out of hand is absolutely minimal. Verdict: Received the item very fast. The product was as expected and very good value. Will recommend both the product and Memorybits No need to look anywhere else. Verdict: This memory card is good with very good read/write speed and since it is from Kingston you can really count on it! I used it and am having no problems and since it is 8GB i won't have to change my memory cards for listening to my huge collection of songs. Verdict: Yeah! its a good way to puchasing. it less consume ur time n give more options to choose...........and delivered also in given time period. Verdict: Great little unit works well for me, transfering large files between computers all the time. One has to be careful that the little card does not fall out of the carrier and get lost or worse someone stands on it before it is found to be missing. Great Product - Perfect Price! Verdict: Product was as advertised and delivered in 2 days. Ordered this to use as auxiliary memory in my GPS unit. Easy to install and was automatically recognized by the unit. Allows me to download new maps and extra features on the GPS unit. Verdict: I have been using this for more than one and half year, the product is too good and strongly recommendable. Verdict: I was purchased this product through infibeam. Delivery time was satisfactory, and product quality is quite good I was used this since three months still I don't find any problem with this memory card. Data writing speed is good compare to my previous card. Verdict: Used the card to supplement the memory in a car GPS, other than not inserting the card completely the first try the memory card works fine. No issues, I would buy this card again from B&H, best price I could find with shipping included. Verdict: Good product from respectable brand, Value for money if you need large capacity and you don't use it for HD video recording. Easy & Ready To Go! Verdict: I popped the card in and it was ready to use within seconds... did not seem to need formatting. The tablet had no problems accepting it and so soon after I popped it in and the tablet initialized it in seconds, it was ready to use and so far no problems. Verdict: I picture myself buying the most expensive model of anything I take fancy to, but then I wake up and realise that I live in the real world, my world, and the name of the game is value (because with wife and two kids that's all I can do). These cards are just that. Kingston are great products. Great value. Verdict: Bought this for RPi Rev B. It works perfectly with Raspbian and xbmc. I also encountered problems with raspbmc. I think raspbmc has problems with their image files so I tried another xbmc distro. Just an advice as much as possible always use linux based os when making an RPi disk. Verdict: Does exactly as described and as always with Kingston brand, it is very reliable and well made. I use it in my BB 9900 to hold just under 17.5GB of songs and it does just fine. For the price, I would highly recommend. Verdict: We use this 32GB class 10 Kingston Technology SDHC memory card to keep our kids' movies readily available when we're out on the road, just pops right into the memory card slot and works like a charm. We transfer movies from our laptops and external hard drives to it. Verdict: Lots and lots of storage, reasonably quick i/o, not significantly dollars. What more could a single ask? This item is a winner from the efficiency standpoint, and at Newegg's price it's a strong bargain. Immediately after about 4 months of use, practically nothing unfavorable to say. Verdict: You guys are a Great! Products arrived quickly, I formatted it, Works Great! The Kingston memory that I have, have not fail me yet. You are one of my top 3 online retailers that I trust and rely on. Kudos, gentlemen. Verdict: Great price. Tried to get this at Staple's and they As usual always out of stock. Great price and product. Verdict: As with most consumers these days I was looking to save a few bucks by going with this MUCH cheaper option. I've only owned 2 other memory cards, and both are still functional after many years. This card ceased to function after only 6 months. Verdict: I stored all my data as a backup to my flash drive. Great speed; even transferring Gigabytes. It would not fit in my camera; so I could not use it to extend the memory of my camara. Verdict: it works perfectly in all devices i tried! Though could be faster! Verdict: I use it with my phone and it works great. I can store video and music and play those back without any issues. Also I have moved my apps to this card with app2sd. Highly recommended!! Verdict: I was a bit wary about purchasing this SD card with the camera bundle but it's seems to do the job. Other SD card makes provide a lot more information about their operation but this seems to do what it says on the tin. Verdict: Bought this for my PL170 Samsung camera. I need not worry about storage as 16G is plenty. Comes with SD adapter for card readers. Great service from Overclockers once again. "Kingston microSDHC 16GB Class 4"
Verdict: After getting my brand new HTC Desire HD I discovered it only came with an 8GB micro SD, so I upgraded to this one at around ￡14, which works out as about a GB per ￡1. I've come to trust Kingston over the years as one of the best, if not the best, only rivaled by SanDisk. Verdict: Very Unsatisfied. I went on vacation to Alaska and used newly purchased Kingston 16gb sd card andHalfway through the 1st day of my trip I find out it is a bad card w/ all my Alaska photos that can't be recovered. Buydig will not refund the money, and I was told to contact the Kingston card company.